When people think of fairy gardens we generally think they are just for girls but boys can enjoy and benefit from fairy gardening too. After welcoming a little boy into our family in October I am more determined than ever to prove that fairy gardens can appeal to boys. I don't want him to miss out on this great imaginative play opportunity that is so much fun for his big sister. 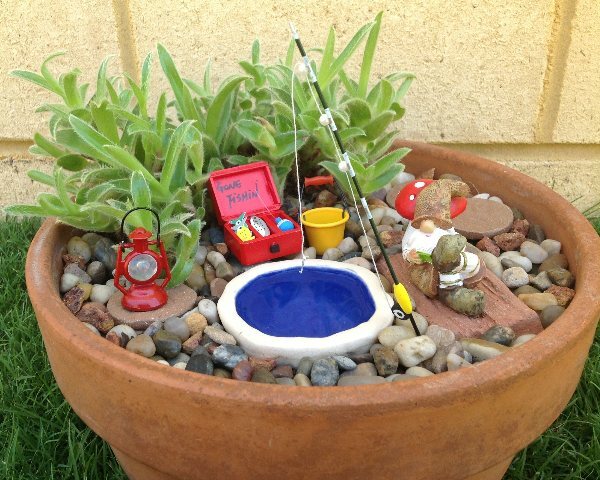 When these gnomes arrived I knew they would be perfect in a fishing themed garden. The one I've chosen is resting up against a mushroom reading his book while waiting for the fish to bite. This garden was so simple to create and is very easy care if you choose a succulent like I did. Pebbles are a great ground cover while you are waiting for your plants to grow. You can use any container you have lying around as a pond. This is a pottery one I made which has been glazed blue on the inside for a water effect, but you could use a clear plastic or glass dish and paint the outside blue for a similar effect. I think this could be one of my favourite small pot gardens that I've created. My daughter also loves it too. What do you think? Fairy-tastic Chocolate Free Easter Egg Hunt!